Specifically designed to use whenever you need a compact sight. 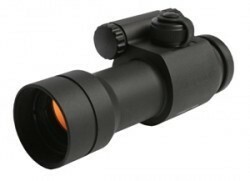 The CompC3 sight is the lightest sight in its class. Ideal for Scout Rifles, Bows Carbines or Handguns. Easy to mount with the 30mm Ring Supplied. Fits Weaver type Mounts. New ACET tecnology allows 50,000 hours of operation on one battery. Submersible to 15 feet of water.